The In Memory program honors those who died as a result of the Vietnam War, but whose deaths do not fit the Department of Defense criteria for inclusion upon the Vietnam Veterans Memorial in Washington, D.C.
Every year there is a ceremony to pay tribute to these men and women who sacrificed so much for their country. The ceremony is held on Flag Day. 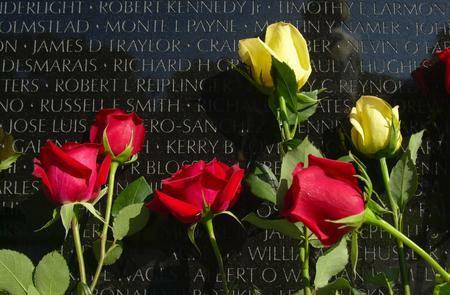 A wreath will be placed at the apex of the Vietnam Wall in tribute to these fallen heroes. The following Father's Day Weekend, volunteers join sons and daughters of those whose names are inscribed on The Wall and affix long-stemmed roses with messages of love and honor, sent from across the country to those lost in the war. Each message is read aloud and each rose is touched to the loved one's name on The Wall before finally being placed at the base of the Memorial.